Hello everyone, I hope you all had a great day yesterday! 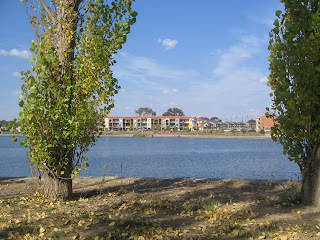 Todays pic is at Amaroo (yerrabi pond) near my place. Pete and I have been taking my dog there most weekends lately on a Saturday to relax. We've been taking alittle esky with our lunch and some chairs and just chilling out and watching the world go by. My dog loves it as we can have him off the lead so he gets a good stretch! So training this week has been awesome. I beat my 5km run again!!! Last Tues I did it in 30.50mins, then I did it in 29mins last Thurs, then on Tues this week I smashed it again and did 5km in 26.40mins!!!!!! I was totally stuffed after but it felt good. So I get a message from my Mum last night and she is now down to 80.5kg!!! GO MUM!what a champion effort she is making. I just keep telling her how proud I am of her. So thats about 4.5kg in 4 weeks. I think thats a good weight loose and nothing to crazy so she should keep it off...as long as she keeps eating healthy and exercising. Well I have tomorrow off work as Im getting my hair done :) LOVE having my hair done its nice to be pampered! Then on Saturday its spin in the morning and then off the Fyshwick to look at a work bench for Pete (for the new house) and some nice new furniture too!! Also wanted to wish Deb the best this weekend!!!!! Your already a super star honey and have proven that even more by coming first place last Sunday! Have an awesome day on stage again this Sunday! Im still hanging to see some piccies :-D Your a true CHAMPION! Pete, Zel and I only went to dinner and it was a really fun night. Above is us at the restaurant. So it was also awesome news that Deb came first in her comp on the weekend!! Im soooo very happy for her :) Thanks Deb for keeping me up todate! when I got to work this morning my Director called me to his office and I was given the fantastic news that they are putting me in another position at work and that means a higher level and a good payrise!! Yay thats more money that I can now save for the QLD move, just to make things run that much smoother! Well Im as proud as punch!! I called my Mum yesterday fir a chat and she told me that for the last 3 weeks she has been on a program to loose weight!! I have been at her for ages about her weight that she has put on over the past few years and she always just put it off. Now she has gone by herself and taken responsibility for it. She went to the local chemist who she has known for years and he has put her on a really good and easy to follow program. Lowered her carb intake as she was a carb-a-holic and added more protein and fiber rich foods to her diet. She said she hadnt eaten bread in over 3 weeks and felt amazing for it (yes Mum like I didnt know this LOL!) Mums pretty tall (unlike myself) and weighed in at 84.9 she is now 81.2kg!! Her goal is to get to 70kg which I think would be an ideal weight for her. Soooo this morning was up bright and early and headed to the gym for another awesome training session. Shoulders today and I love training them!! I did lots of super sets on them and really got a good burn! It was then onto the treadmill and I wanted to beat my 5km run time of 30:50mins...and I did it :) This time I did 5min jog warmup, then onto 10mins of intense sprints of 30secs at level 16.5 with 1min rest break. After that I did a steady jog for 15mins from level 11 through to 12. I feel so alive!!!! Soo I did my 5km in 29mins!!!! YEAH BABY!! brrr.....tis a chilli morning in the ACT this morning :-/ As always I parked at the War Memorial (cause its free parking) and walked into Civic, its only a 12mins or so walk but my finger tips surely felt the cold this morning!! Think it is almost time to get the winty gloves out! Tuna omlettes have been on for my lunch this week and yummmo am I enjoying them!! Little bit of pepper and a mushroom with it and its a great filling meal. Pete and I are heading to Brisbane for a weekend soon to meet with our builder..Im very excited as we'll get to pick all our colours, tiles etc... 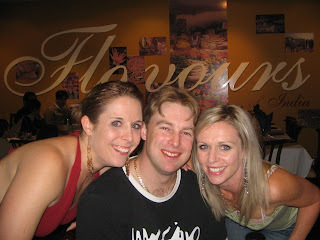 I would have loved to catch up with some of the girls from QLD that I know but its a very quick trip and I wont have enough time. I worked out by time we visit the builder and get back to the ACT it will be approx 6 months till we move!!! Its going very quickly and Im very very happy about that. I cant believe how quickly this week has gone..Ive been flat out at work and thats just made it go that much quicker :) Yeahhhh its almost the weekend again!!!! have a wonderful day, smile and believe cause you will achieve!! Also on Sunday morning we are heading to Mt Ainsley to watch the Balloon Fiesta! http://www.balloonfiesta.com.au/index.cfm?action=news_details&ID=24 I think we'll get some take away coffees for when we are up there. We are also taking Bull with us so he gets to run around and get out of the yard! Saturday morning we'll be at the 9.30am Spin class! I love this class on a Sat morning,its such a wonderful way to start the day! we'll then go to the mall and head to the lovely italian deli for some fresh lunch meats and then off to Bakers delight for fresh whole meal rolls! YUM! 5min warm up jog / skipping 100 times / sprint around basketball court / 20 step ups / 100 skips on rope / sprint / running side ways / 100 skips / step ups / 6x100m sprints. Im so happy with my train, nutrition and the balance I have in my life. Im getting great results and feeling fit and healthy and most important happy :D I even lost a couple of hundred grams with week and am sitting just under 55kg. Isnt it funny how at times when we are more relaxed in life that our bodies respond the most! Although I am also using the right tools but training hard and putting clean food in my mouth 90% of the time!! Well I hope you all have a great weekend, may your lives be filled with happiness, good fortune and positive enery! I hope you are all having a totally fab day so far! Its a gorgeous day here in the ACT today, the sun is shining, Ive been up early hit the gym for a smashing legs session and getting through all my work so far for the day! For legs this morning I super setted all my exercises and did 4 sets of 15to 20 reps! What a great burn I got and also got the heart rate up! standing single and double leg calves, back to back. it was a quick, short rest break workout and smashed my legs nicely. I have also been using dumb bells lately instead of the bar and squat racks for something different. You need better core strength I think and good balance!! So other exciting news, this is our builder that we will be using http://www.intrepidhomes.com.au/designs.html Our place is the 'Tosca' design. We have been so happy with the level of service this far and they havent even started building yet!!! Kinda also been getting into decafe coffee lately, I guess its better then having to much full strength coffee..I think cause its getting much colder here Im going for the hot drinks to keep me warm, LOL and its not even winter yet! Eeek! Well have a great Hump day everyone and remember to smile everyday!!! hello and a Happy (late) Easter!! 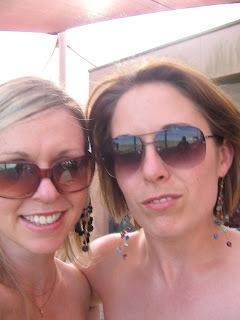 todays pic is of me and my roomie Zel, she's such a great chickie!!! Man Ive been lazy with blogging lately...but I have been very busy lately! Andrea...Im sorry we totally missed each other over Easter! I actually thought I had given you my mobile in my last email I sent you...I was wondering all weekend if you had come to Canberra still, then I thought maybe you plans had been cancelled! We'll have to be more organised next time :) I hope you had a great weekend in the ACT and enjoyed the folk festival. So ive been training pretty hard lately, getting in some extra spin classes and also some extra jogging, still smashing out the weights as usual :) Can you believe that my gym was closed on Good Friday! !I was so very annoyed as it was open last year! So I did my weights session on Sat morning instead and it was alll good...although it meant I missed my Sat morning spin class! Pete and I put together our 'wish list' for the extra's we want in our house and have sent it off to the builder. We also went on a huge walk on the weekend and got some great ideas (from other peoples houses) to what colour we want our cement-render.We are going a sand stone render with a gunmetal grey roof tiles and then the window frames and panel door will be black! Its going to look sensational!! now its a waiting game for it to be built!